In preparation for an expansive outdoor performance in Spring of 2013, I am teaching free voice lessons to potential participants. This is open to people of all ages. Considering the timeframe, I can likely work with anyone, though some music ability would be appreciated. Experienced singers are welcome, as I teach to a professional standard. I can be reached in person on Wednesday afternoons at Columbia City Gallery. 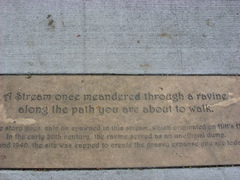 The performance will occur in May of 2013, behind the Columbia City Library. 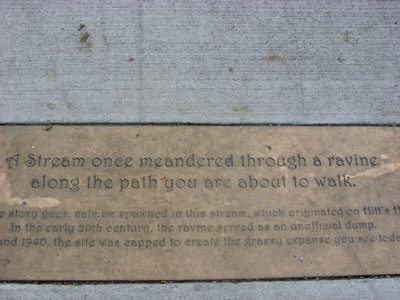 The title, "In Buried River," is related to the stream that once flowed below what is now a path. Among the works performed will be "Lord, Thou Hast Been Our Refuge" by R. Vaughan-Williams. It is a moving work for large chorus and organ. Depending on instrumental possibilities, the organ may be transcribed for a small, brass-heavy orchestra. The chorus is projected to include upwards of 200 singers, representing primarily this locale and with contingents from other local choirs. Many will be invited to participate. As primary reasoning for offering voice lessons, I recognize that most people would be unprepared to sing this work, yet I am interested in making it open to as many as possible. A substantial part of the project's strength comes from the involvement of non-professionals - representatives must be real people, who have also developed a sensitivity, as everyone can, for music. Other pieces under consideration represent local cultures and ethnicities, including Native American. Diversity is a key component of the project. This will function as a culminating project for my MFA studies in Arts Leadership through Seattle University, but is primarily a community centered endeavor.